CSUN journalism students enrolled in “Journalism 498 Senior Capstone Advocacy for Nonprofits” have the opportunity to gain hands on experience working for local nonprofit. Photo by David Blumenkrantz. 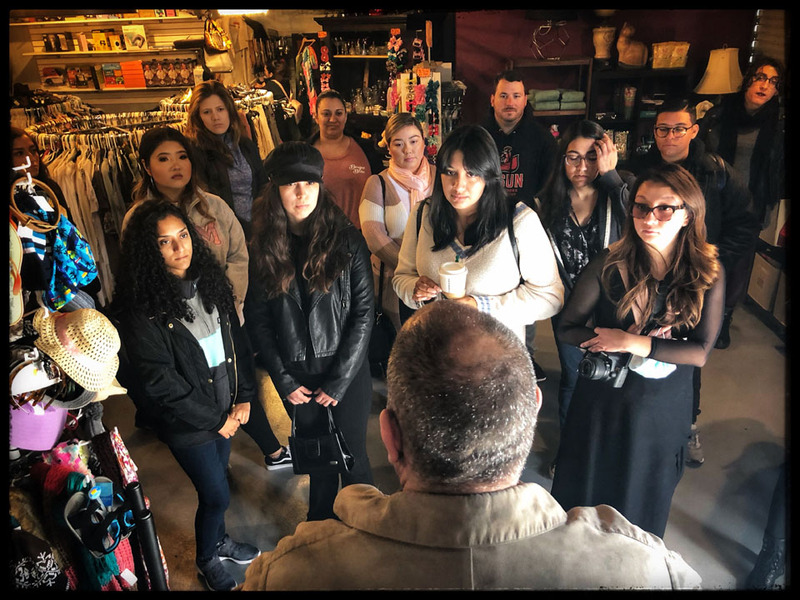 To raise awareness while instilling fundamental skills, CSUN journalism professor and alumnus David Blumenkrantz partnered with a local nonprofit organization to teach graduating journalism students how to advocate for the homeless and those struggling with poverty in North Hills. Blumenkrantz, a documentary photographer who has worked with the homeless community since he began his career in the early 1980s, designed the senior capstone course, “Journalism 498 Senior Capstone Advocacy for Nonprofits.” It engages students to use writing, photography and multimedia content in work with a local nonprofit organization, North Valley Caring Services (NVCS). The course partners students with NVCS, which offers the community supportive services such as a breakfast program, a safe parking program, and a food pantry for those going through poverty and homelessness in the San Fernando Valley. NVCS also offers the community with a family literacy program, youth program and Colectivo NoHills, an on-site boutique that offers individuals with job training and discounted high-end products. Blumenkrantz said he aims to direct the course in a way that leaves students with lasting work that can benefit their portfolios and nonprofit organizations. Many of the students are participating in the outreach programs biweekly, creating visual content such as flyers, brochures, informational videos and press kits for NVCS, giving the students client-based skills that can last beyond their graduation. Blumenkrantz received CSUN’s Community Engagement Disciplinary Grant for the spring 2019 course to support the students’ efforts to create more content for NVCS. “The grant helps the students get involved with the community instead of just reporting on it,” Blumenkrantz said. Blumenkrantz has been a longtime advocate for the homeless, using his lenses and pen to shine a light on unhoused people in the San Fernando Valley and beyond. Blumenkrantz received CSUN’s Exceptional Creative Activity Award in 2018, for his work on “The One of Us” documentary project, that explored homelessness in Los Angeles. He drew parallels from his decade of work in Africa, with street children and other marginalized populations, that began after his college years at CSUN. Blumenkrantz earned a bachelor’s degree in journalism in 1985, as well as a Master of Arts in 2003 and a Master of Fine Arts in Visual Communication at CSUN in 2009.